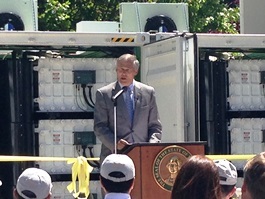 July 9, 2014 — Progress in the state’s energy storage and smart grid projects received a big boost this week. On Tuesday, Governor Jay Inslee announced a major state initiative to leverage state matching funds for three projects that will integrate power generated from intermittent renewable sources, such as wind and solar, in the state’s electrical grid. The project involves three of the state’s major utilities and research institutions, including the Pacific Northwest National Laboratories and the University of Washington Clean Energy Institute. Professor Daniel Kirschen, a CEI faculty member and professor of electrical engineering, will participate in the utility demonstration projects working alongside the Pacific Northwest National Laboratory (PNNL). Using data collected by PNNL, Kirschen will be assessing the economic value that these batteries create in the electrical grid as a function of various technical parameters such as the battery power rating, energy rating, location, and how the battery and storage is being used in the individual demonstration projects. Using this data, the team can then draw conclusions about the long term value for larger scale deployment of the batteries and energy storage applications in Washington state and beyond.